NORTH MERRILL ENGINEERING BUILDING PARKING IMPACTS: The North Merrill Engineering Building parking lot underwent fence installation on Jan. 29, 2019. Ten stalls will be out of service through late spring 2019. Let us help you stay safe on campus. 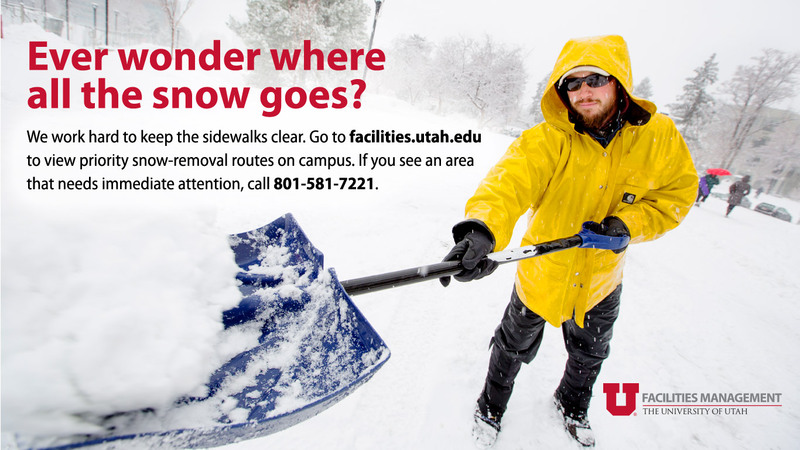 To report unsafe conditions, please contact snow removal at 801-581-7221. WASATCH DRIVE AND STUDENT LIFE WAY IMPACTS: Construction continues on Wasatch Drive roundabout. See the updated impact map below for new route. Student Life Way is limited one-way traffic at times when heavy construction equipment is being used. Flaggers will help direct traffic during these times. 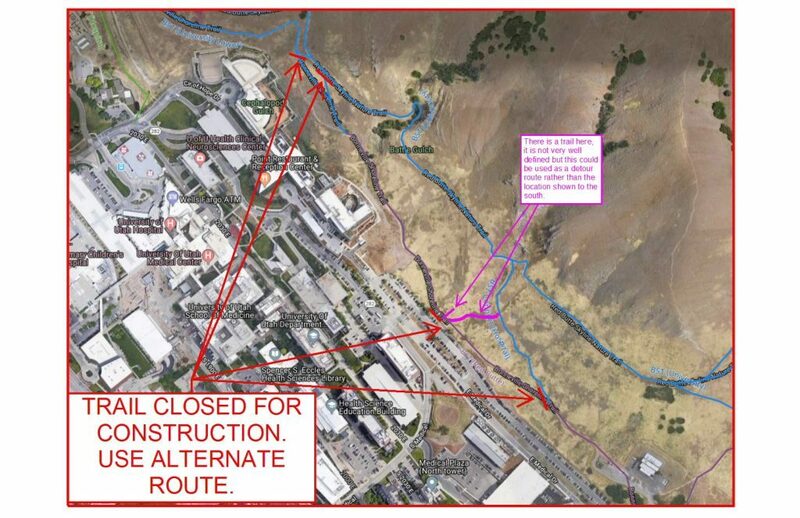 Please note that left turns into student life will not be allowed at this time and we encourage traffic to come southbound Wasatch Drive to turn right at Student Life Way. 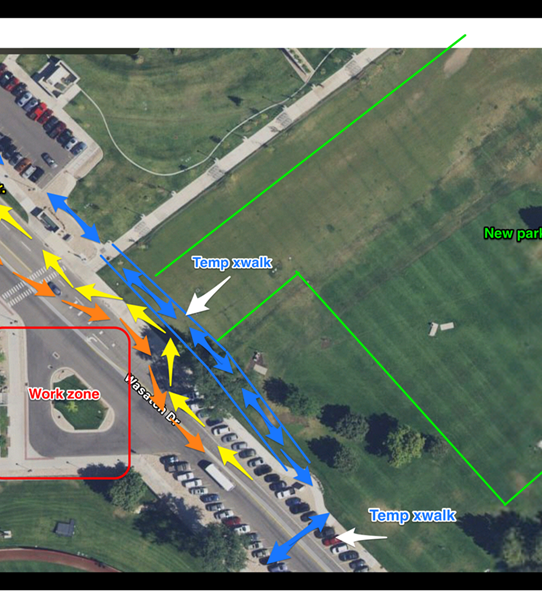 The Wasatch Express will detour straight to the Ambulatory parking garage using North Campus Drive. If you have any questions about the Wasatch Express or if you would like additional information on campus transportation, contact U Commuter Services at 801-581-4189. 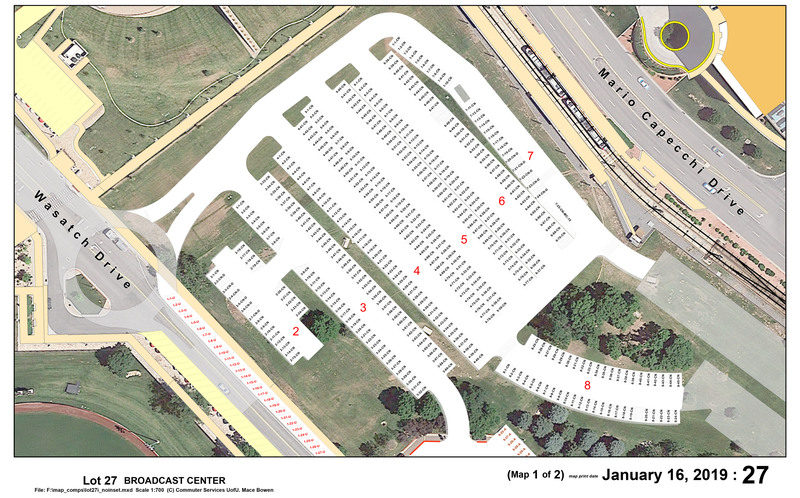 WASATCH EAST PARKING LOT: The north portion of the Eccles Broadcast Center parking lot expansion continues. Nearing completion, this roughly 450 stall U lot will be partially open. Several hundred stalls will be available until construction is complete. The construction is still ongoing with lot paving scheduled and sidewalk construction through the end of December. SHORELINE GARAGE: U Health campus and hospital employees, level 2 of the Shoreline Garage has recently been opened to A permits. Roughly 100 stalls are available (first come, first served) no other permit is required. 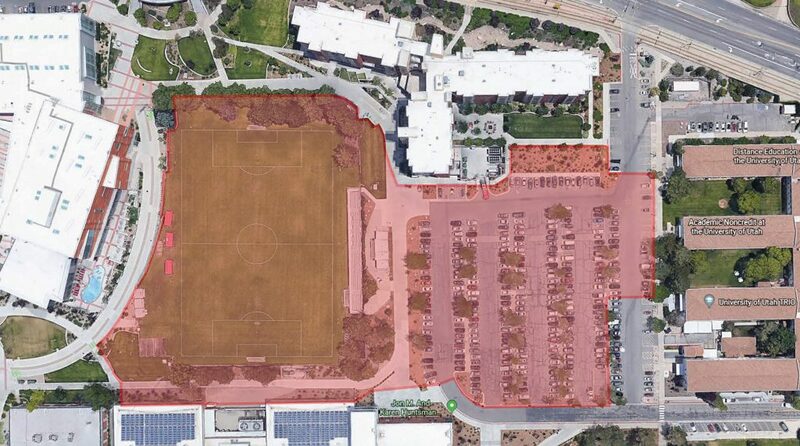 CENTRAL PARKING GARAGE: Now all levels of the garage are open to U permits after 3 p.m. With the exception of special events and games hosted in the Huntsman Center. Reserved stalls and loading zones will still be enforced. Check lot entrance signs for event dates/times. 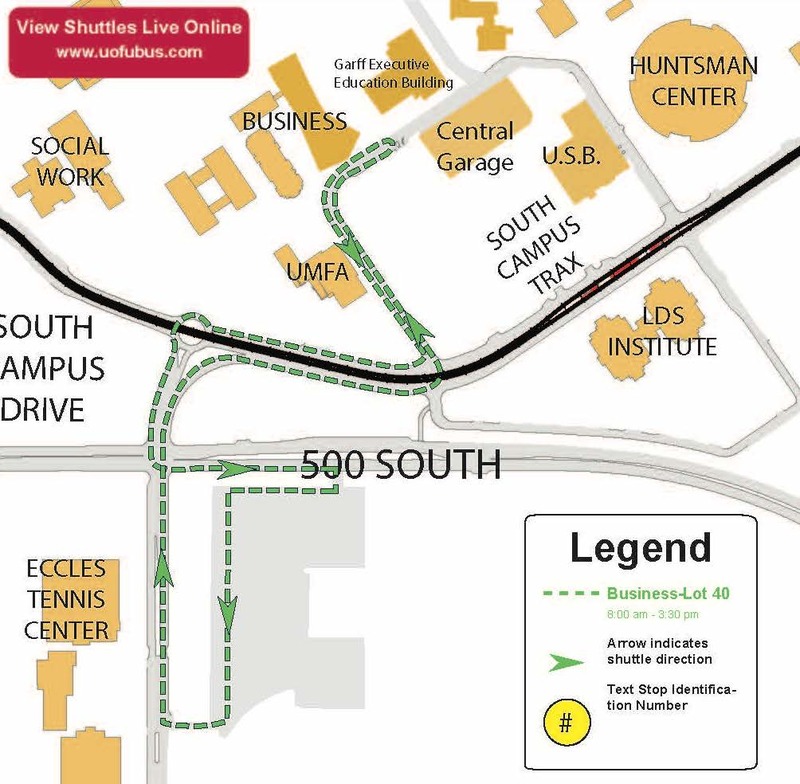 NEW GUARDSMAN SHUTTLE ROUTE: This new route will run between the Guardsman Way Lot to the Business Loop where transfers to the Union electric shuttle route can be made. 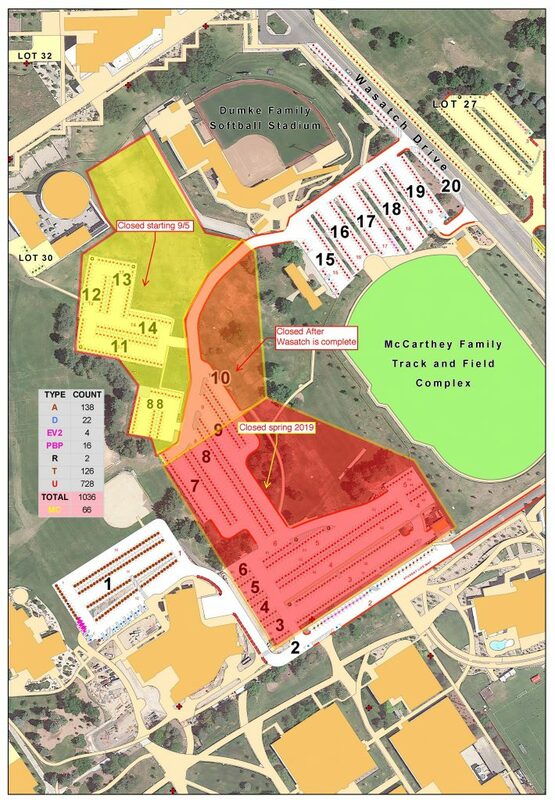 Shuttle will run Monday-Friday from 8 a.m.-3:30 p.m.
SOUTH CAMPUS HOUSING AND DINING: Construction for the new South Campus Housing and Dining Facility has begun in parking lot 22 and the women’s soccer field. Parking in lot 22 is closed. Construction will be ongoing until June 2020. SOCCER/LACROSSE STADIUM CONSTRUCTION: Construction on the soccer/lacrosse stadium began on Sept. 5, 2018. Rows 11-14 (the L shaped area off the road) and row 88 (the old tennis courts) have been removed. The roadway and additional parts of the area are now closed. These are permanent closures and parking will not return. HUNTSMAN CANCER INSTITUTE PROTON ADDITION: Huntsman Cancer Institute is preparing for the construction of a Proton Treatment Facility. This facility will be located in a mainly underground concrete facility to be located in the east hillside between the HCI 555 Building and HCH 556 Building. Construction will begin in February 2019. Please expect partial trail closures to occur during this time. STORMWATER DRAIN PLAYFIELD CONSTRUCTION: The grass field between the McCarthey Family Track & Field and Lassonde Studios is undergoing construction to install a stormwater drain. This project is expected to span two years and be completed in August 2019. Access to this area will be closed for the duration of the project. HTW COMPLETION: High-Temperature Water Pipeline replacement completion will occur campus-wide, with sections fenced off throughout early February 2019.